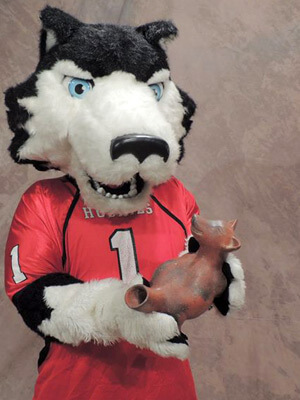 The Illinois Association of Museums (IAM) continues to give critical acclaim and recognition to NIU museums, galleries and the university’s Museum Studies certificate of graduate study. Awards will come during the association’s annual Fall Conference, which begins Thursday, Sept. 24, in Springfield. This year marks the fourth year the association honors a graduate student in museum studies with the Student of the Year Award; all four years, that recipient has been a student from the NIU Interdisciplinary Museum Studies Graduate Certificate Program. Michelle Stewart joins 2014 museum studies and MA Art History alumna Alison Bastian, 2013 Museum Studies and MA Anthropology alumna Ashlee Craig, and 2012 Museum Studies/2015 MFA Metals alumna Agnes Ma. 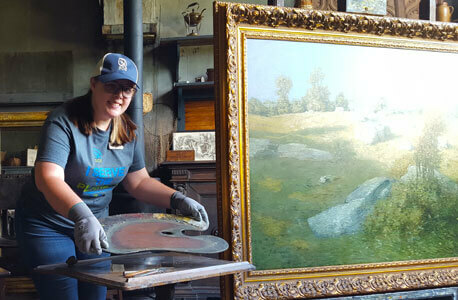 Stewart is currently serving a one-year internship at the Weir Farm National Historic Site in Ridgefield, Ct., as centennial volunteer ambassador. Bastian is a collections assistant at the Field Museum in Chicago, Craig is the museum supervisor at the Downers Grove Park District Museum and Ma currently serves as curatorial assistant at the Ellwood House Museum in DeKalb. The Museum Studies exhibition “Brewing Identity: The Art of Craft Beer” has been recognized with an Award of Merit in the Exhibit category. The reviewers, comprised of museum professionals around the state, liked the uniqueness of the topic and its interpretation in exhibit form. The use of the laser cut state shapes and the in-house construction of the wall mounts for the objects was a fine use of talent and available resources. The reviewers also appreciated the use of pre- and post-exhibition evaluation methods which provided valuable feedback for the students to react to and learn from. IAM applauds the museum for opening its collection doors and allowing students, university staff, the community and others to choose the objects and stories to tell. This unique experience gave them a wonderful opportunity to engage firsthand with an institution they may not be all that familiar with or at least the collection. The Northern Illinois University Art Museum’s “Local Visions: Selections from Area Collections” has been recognized with an Award of Excellence in the Exhibit category. Jack Olson Gallery’s “Graffiti Imagery in Contemporary Art” exhibition, co-curated by Bastian and fellow 2014 NIU Museum Studies and Art History alumna Alyssa Yaracz, has been recognized with an Award of Merit in the Printed Materials category. The exhibition catalog contains essays by the curators as well as interviews with the artists.